We set out to study this by conducting a survey of 1,801 adults.2 It focused on one important public issue: Edward Snowden’s 2013 revelations of widespread government surveillance of Americans’ phone and email records. We selected this issue because other surveys by the Pew Research Center at the time we were fielding this poll showed that Americans were divided over whether the NSA contractor’s leaks about surveillance were justified and whether the surveillance policy itself was a good or bad idea. For instance, Pew Research found in one survey that 44% say the release of classified information harms the public interest while 49% said it serves the public interest. At work, those who felt their coworkers agreed with their opinion on the government’s surveillance program were 2.92 times more likely to say they would join a conversation on the topic of Snowden-NSA. 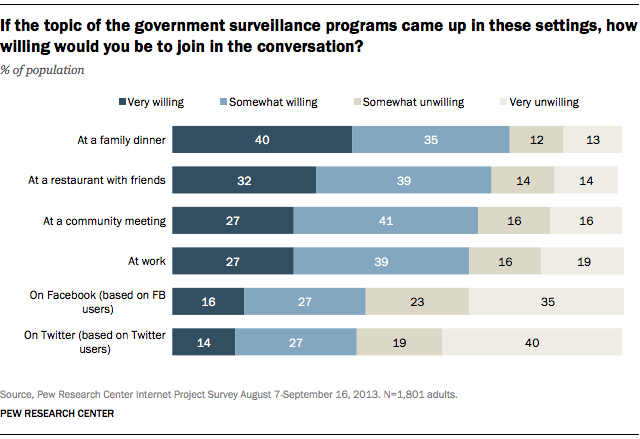 At a family dinner, those who felt that family members agreed with their opinion were 1.90 times more likely to be willing to discuss the Snowden-NSA issue. At a restaurant with friends, if their close friends agreed with their opinion people were 1.42 times more likely to be willing to discuss the Snowden-NSA matter. On Facebook, if a person felt that people in their Facebook network agreed with their position on that issue, they were 1.91 times more likely to be willing to join a conversation on the topic of Snowden-NSA. The survey did not directly explore why people might remain silent if they felt that their opinions were in the minority. The traditional view of the spiral of silence is that people choose not to speak out for fear of isolation. Other Pew Research studies have found that it is common for social media users to be mistaken about their friends’ beliefs and to be surprised once they discover their friends’ actual views via social media. Thus, it might be the case that people do not want to disclose their minority views for fear of disappointing their friends, getting into fruitless arguments, or losing them entirely. Some people may prefer not to share their views on social media because their posts persist and can be found later—perhaps by prospective employers or others with high status. As to why the absence of agreement on social media platforms spills over into a spiral of silence in physical settings, we speculate that social media users may have witnessed those with minority opinions experiencing ostracism, ridicule or bullying online, and that this might increase the perceived risk of opinion sharing in other settings. The intensity of their opinions. Those who said they had strong feelings about the Snowden-NSA matter were more willing than those with less intense feelings to talk about the subject. People’s use of social media did little to increase their access to information about the Snowden-NSA revelations. We asked respondents where they were getting information about the debates swirling around the Snowden revelations, and found that social media was not a common source of news for most Americans. Traditional broadcast news sources were by far the most common sources. In contrast, social media sources like Facebook and Twitter were the least commonly identified sources for news on this issue. There are limits to what this snapshot can tell us about how social media use is related to the ways Americans discuss important political issues. This study focuses on one specific public affairs issue that was of interest to most Americans: the Snowden-NSA revelations. It is not an exhaustive review of all public policy issues and the way they are discussed in social media. The context of the Snowden-NSA story may also have made it somewhat different from other kinds of public debates. At the time of this study, the material leaked by Edward Snowden related to NSA monitoring of communications dealt specifically with “meta-data” collected on people’s phone and internet communications. For a phone call, the meta-data collected by the NSA was described as including the duration of the call, when it happened, the numbers the call was between, but not a recording of the call. For email, meta-data would have included the sender and recipient’s email addresses and when it was sent, but not the subject or text of the email. Additional information leaked by Snowden after our study was completed suggests that Western intelligence agencies monitored and manipulated the content of online discussions and the NSA recorded the content of foreign phone calls. In reaction to these additional revelations, people may have adjusted their use of social media and their willingness to discuss a range of topics, including public issues such as government surveillance. However, given the limited extent of the information leaked by Snowden at the time the survey was fielded, it seems unlikely that the average American had extensively altered their willingness to discuss political issues. Future research may provide insight into whether Americans have become more or less willing to discuss specific issues on-and offline as a result of government surveillance programs. While this study focused on the Snowden-NSA revelations, we suspect that Americans use social media in similar ways to discuss and get news about other political issues.